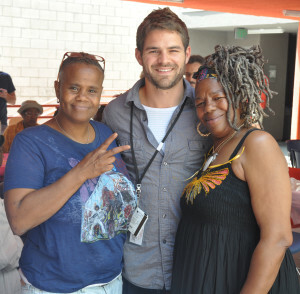 The Skid Row Housing Trust motto is “Homes, Support, Success.” The Resident Services Department plays a critical role in carrying out that motto. One of the department’s goals is to provide the support that leads residents to their own defined success. The department is comprised of 45 diverse individuals who come from various backgrounds and bring different perspectives to the job. Some of us have come to the Trust with many years of experience working with people who are homeless and have dedicated their lives to ending that cycle. For others, the Trust was their first glimpse into the world of homeless services. Some of our staff have advanced degrees in social work or psychology, others are certified in alcohol and drug treatment, and some have even shared the same experiences as our residents. Resident Service Coordinators (RSCs) are a valuable resource and an integral component of the Resident Services team. RSCs address the needs and difficulties of residents which can jeopardize tenancy and work to develop effective partnerships among housing providers, property managers and service providers, thereby promoting residents’ success. RSCs provide a number of case management services, essentially providing a single point of accountability for coordination of services. In supportive housing, these services are designed to offer the resident support in living independently and establishing and maintaining residential stability. RSCs help residents with special needs to achieve their goals and meet their needs through provision of, or linkage to, various services. Even though we are a unique, diverse, set of individuals, we share something that bonds us: accompanying the residents as they make their journey through life and often death, and to bear witness to their victories. Oftentimes, staff are asked by friends and family” why do you do the work you do? Everyone responds differently. Many will answer that question with a story or anecdote about a resident whose journey has made a lasting impact on their work and their lives. Some people enjoy their work simply because they can help someone get a home after many years of living on the street. Before becoming a Housing Transitional Specialist with the Trust, Senior Resident Services Coordinator (RSC), Richy was an outreach worker partnering with us on the Prioritization Project. Before that could even become an option, Richy had to help J.G. secure his birth certificate, Social Security card and a California I.D. Once these items were in hand they were able to help him obtain General Relief benefits. During this process Richy had the opportunity to come to work at the Trust, but his new position still allowed him to continue to help this man. Due to J.G.’s skepticism of the system, some untreated mental health issues and complete fear of both medical and mental health providers, it took another four months to make the final housing placement. “A couple weeks ago I was sitting in my office when a co-worker came in and shared with me that one of my residents, Mr. G., who was in his early 70’s, passed away. This news came as a complete shock, and although in this job I have lost several residents and each very sad, this one, along with the tears, has come with a great joy- a joy that I never anticipated three and a half years ago when I walked onto these streets. I can honestly say that I have never experienced a changed life like what I witnessed with Mr. G. When he first came into my office, a little over a year ago, the first thing I noticed was that he was missing an eye (from a previous altercation), he smelled like the streets and spoke some of the most obscene, yet rarely coherent things I have ever heard (I do not shock easily….he shocked me). The first couple of months he would often just start roaming down the middle of the street, in traffic and oblivious to the danger. Staff would have to coach him to step to the sidewalk and then point him in the direction he was heading and stay with him. Through a lot of hard work and dedication from the team I worked with, we were eventually able to get Mr. G on proper medication, which enabled him to live a life in which he learned to ride a bike, do yoga, win a game of corn-hole (with yours truly as his counterpart) and even began attending a senior day center that he loved (chair aerobics anyone??). He made some genuine friends that he was able to share time with regularly. Often time the people outside of our community don’t understand why someone would choose to work so closely with individuals who are homeless on Skid Row. It can be very draining work, and for many people it is not even a consideration. Those that do decide to take on the task, many times, find that it is one of the most rewarding experiences they could have imagined. Albert Schweitzer wrote, “In everyone’s life, at some time, our inner fire goes out. It is then burst into flame by an encounter with another human being. We should all be thankful for those people who rekindle the inner spirit.” Like Schweitzer, many members of the Resident Services department have a strong sense of human solidarity and a strong reverence for life. RSC Jose is one.